Is There an Optimal Time to Work Out? 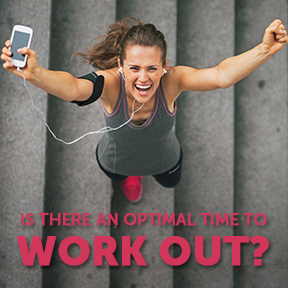 Posted on March 1, 2019 | Comments Off on Is There an Optimal Time to Work Out? While ‘morning person’ and ‘night owl’ are not scientific terms, researchers theorize that each of us has our own individual chronotype influenced by physical biomarkers. The hormones melatonin that encourages sleep, and cortisol, that helps us wake, help determine whether an individual is “programmed” to start and end the day earlier or is naturally inclined to sleep in and stay up later. Those who wake early have more energy in the morning, while those who stay up late feel more energetic later in the day. Of course when we sleep and when we rise is determined by other factors, such as lifestyle decisions and our environment. It may help explain though, why some feel empowered in the morning and others not so much. Finding or making time to exercise can be challenging, yet there’s really no wrong time to do it, as any amount of exercise is better than none. However, those who wish to optimize their workouts might try working out at different times of day to find what feels most advantageous. Working out in the morning on an empty stomach is an ideal way to burn stored fat. Per Anthony Hackney, a professor in the department of exercise and sport science at U.N.C. Chapel Hill, natural elevation of cortisol and growth hormone levels in the morning results in more energy drawn from fat reserves, which can potentially aid weight loss. Additionally, morning exercisers tend to consume fewer calories and make healthier food choices, as well as have more consistent energy throughout the day. Some research suggests that exercising before life’s responsibilities interfere leads to improved consistency. As exercise is a great stress-reliever, morning activity may lead to a calmer, yet more productive day. If you’re truly not a morning person and find you’re exercising at a low intensity, a more energetic workout later in the day could be more beneficial. If you can get out for a workout or walk during the lunch hour, it can help boost performance and focus. Some research has shown that the body naturally burns a slightly higher amount of calories during late afternoon compared to morning and evening. Research also suggests that the body is adaptable to consistent timing, resulting in better performance, higher oxygen consumption and lower perceived exhaustion over time. As well, the body’s core temperature may also influence exercise quality, since in late afternoon muscles are more flexible, body temperature is highest, heart rate and blood pressure levels are lowest and reaction time is quickest. Combined, this can mean better performance and less chance of injury. Exercising after work or in the evening is a matter of convenience for many. Contrary to the popular belief, nighttime activity doesn’t necessarily interfere with sleep patterns, as long one doesn’t expect to sleep immediately following exercise. Stress relieving activity, such as yoga or gentle stretching, is recommended for relaxation, as well as a proper night’s sleep. Some evidence suggests that evening workouts can reduce levels of the hunger-stimulating hormone, ghrelin, further aiding weight management. While the general consensus is that morning exercise is best, timing of exercise is personal. For most people the key is to exercise regularly at whatever time works with one’s daily routine. While one can be flexible and work out at different times on different days, scheduling a set time to exercise supports consistency and follow through. Activities such as walking, biking, swimming, dancing, yoga or strength training can be done at any time of day. Be sure to warm up cold muscles, especially in the morning and remain steadfast in your commitment for optimal health benefits. Energy/Sports Formula by Douglas Laboratories®: This comprehensive formula provides proper proportions of synergistic bioavailable vitamins, minerals, trace elements, digestive enzymes and botanicals in support of energy metabolism during sport and exercise. Free of yeast, wheat, gluten, soy protein, milk/dairy, corn, sodium, sugar, starch and artificial coloring, preservatives and flavorings. BCAA by Pure Encapsulations®: BCAA provides the branched chain essential amino acids leucine, isoleucine and valine in support of muscle function during exercise, as well as post-exercise muscle recovery. Available in powder or capsule form. Gluten and soy free, Non-GMO, hypoallergenic, vegetarian formulation. Power Fuel by Nutritional Frontiers: Power Fuel provides D-ribose and other workout supportive nutrients that help to minimize fatigue and support energy and endurance, as well as muscle strength, physical stamina and exercise recovery. Gluten free, vegetarian formulation. Athletic Nutrients by Pure Encapsulations®: This hypoallergenic, nutrient-rich, highly bioavailable multivitamin, mineral and trace element complex is formulated to support exercise performance and training, promoting energy and stamina and lessening muscle fatigue. Gluten and soy free, Non-GMO vegetarian formulation. Comments Off on Is There an Optimal Time to Work Out? Exercise, a boon for both physical and mental wellbeing, actively supports overall health, improves sleep, and reduces anxiety and depression. A recent study based on data from 8,500 adults who were part of the Copenhagen City Heart Study found that social interaction involving either an exercise partner or participation in team sports further enhanced the already plentiful benefits of physical activity. While exercise of any kind contributes to improved long term health and longevity, it appears that connecting socially while exercising may have an advantage over solitary activity. The findings reported in Mayo Clinic Proceedings showed a clear correlation between social sports and increased longevity. 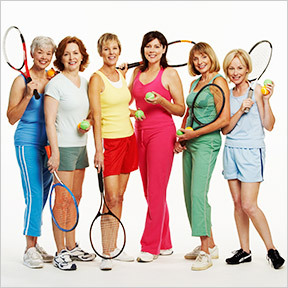 It appears that regular participation in activities such as tennis, basketball, soccer or badminton, may extend one’s lifespan up to a decade, while solitary activities such as swimming, cycling, jogging and health club participation, may add one to four years. A large body of research shows that consistent activity offers numerous health benefits including chronic disease prevention and weight management, as well as cardiovascular, musculoskeletal and cognitive health support. Now, it seems, the addition of activities that promote social interaction may be just as important to long term health as social connection is to overall wellbeing. A World Health Organization (WHO) study found that one in four adults worldwide don’t get enough exercise, putting more than 1.4 billion adults at risk of developing chronic diseases linked to inactivity. In the U.S., only 23 percent of Americans regularly meet physical activity guidelines during their leisure time. Perhaps combining team events and friendship with exercise is just the impetus many need to start and stick with an exercise program. One of the biggest challenges to exercise is motivation. Knowing that others are counting on us, provides the accountability and encouragement that may be missing with solo exercise. Being a member of a supportive team often encourages one to take their activity to a higher level, and for many, brings out their innate competitive spirit. While more studies are needed to support the connection between group exercise and increased longevity, there are other reasons to make workouts communal. Research shows that healthy actions of those around us can have a significant impact on our own health. A study published in the journal Obesity found that overweight persons tend to lose additional weight when they spend more time with friends who are physically fit. Other studies show that working with a partner or a team not only improves performance but may also significantly increase time spent working out. Many appear to agree, as spin-cycling, dance-based classes and other group activities have been steadily trending for a decade or longer. Encouragement to reach personal bests triggers the release of feel good hormones that help create a positive attitude and encourage future participation. Those new to fitness may find it best to work out solo before joining a difficult group session. One on one instruction can help draw the attention to areas of weakness or imbalances. Find a class or group setting that matches your level of ability to avoid injury. Friendly competition is fine but understand your strengths and limitations. A study published in the British Journal of Sports Medicine found that those who engaged in group walking outdoors saw improvements in blood pressure, resting heart rate and body fat. Social walkers were also significantly less depressed. You may find that enlisting a friend for an enjoyable walk in the park, or participating in a boot camp work out, may be just what is needed to de-stress and lift your mood, resulting in an energetic feeling of overall good health. ATP Energy Progressive Laboratories: This energizing formula provides bioavailable Peak ATP®, malic acid and magnesium, essential elements for continued cellular energy production which may decline with aging. Acid resistant, delayed release capsules. Athletic Nutrients by Pure Encapsulations®: This hypoallergenic, nutrient-rich, highly bioavailable multivitamin, mineral and trace element complex is formulated to support exercise performance and training by promoting energy and stamina and lessening muscle fatigue. Gluten and soy free, Non-GMO vegetarian formulation. Klean BCAA + Peak ATP® by Klean Athlete: Specifically formulated for athletes and weekend warriors alike, this products supplies branched chain amino acids and Peak ATP® in support of peak physical performance, increased strength and muscle gain. NSF Certified for Sport. Gluten, soy, wheat, dairy, preservative and artificial ingredient free, Non-GMO formulation. Energy Plus by Vital Nutrients: This herbal adaptogen complex helps to reduce daily stress by supporting energy production, stamina, healthy adrenal gland function and mental and physical performance. Suitable for long-term use. Free of gluten, wheat, soy, dairy, eggs, sugar, binders and coatings.